Hematopoietic Stem Cell Transplantation (HSCT) is an important technology in the treatment of hematologic malignancies. The immunity of patients is compromised after transplantation, and it is easy for these patients to have a variety of infections, which are the major cause to death. Fungal, bacterial and viral infections are common in patients after HSCT . However, there are more and more reports on Tuberculosis (TB) infection after HSCT in recent years . Patients have certain heterogeneity and immunological characteristics after HSCT. The etiological basis of pulmonary TB infection after HSCT is often difficult to find, leading to difficulty in its diagnosis. Sometime, delayed treatment may even endanger lives of patients . The present article reviews the diagnosis, treatment, prognosis and clinical characteristics of two patients who were infected by TB after HSCT. A 16-year-old male patient was diagnosed as high-risk acute lymphoblastic leukemia (cortex T) in May 2013 (WBC, 140.5 × 109/L; Hb, 147 g/L; and PLT, 11 × 109/L. Bone marrow: lymphoblasts, 54%; juvenile lymphocytes, 31%. Immunolabelling: CD3+, 94.50%; CD7+, 99.60%; CD8+, 92.10%; CD2+, 97.60%; CD4+, 61.30%; CD34+, 78.00%; CD38+, 91.70%; and CD5+, 98.40%. Chromosome: 46, XY. The patient received chemotherapy with vincristine, doxorubicin, cyclophosphamide and prednisone scheme for one course and obtained Complete Remission (CR). After receiving three courses of consolidation chemotherapy, the patient received unrelated HSCT. In December 2013, the patient received myeloablative conditioning regimen consisted of busulphan, cyclophosphamide and cytarabine. On day 11 after transplantation, neutral absolute value of leukocytes was over 0.5 × 109/L; on day 15 after transplantation, blood platelets were over 50 × 109/L; on day 30 after transplantation, it showed that full donor chimera by Polymerase Chain Reaction and Short Tandem Repeat (PCR-STR). On day 50 after transplantation, the patient had continuous low-grade fever, cough with less sputum, and skin erythema rash for the entire body. Computed Tomography (CT) of the lungs showed diffuse nodular shadows on the two lungs (Figure 1). Followup serial serum galactomannan assay showed negative result, although the result of T-spot-TB test was positive. In addition, the sputum cultures of M. tuberculosis had negative result. The patient was treated with pyrazinamide, isoniazide, rifampicin and ethambutol. However, the treatment against TB for two weeks was invalid. The patient suffered from severe liver injury induced by anti-TB drugs. Then, we replaced the anti- TB drugs with streptomycin, isoniazide and ethambutol. Unfortunately, on day 65 after transplantation, the patient suffered from headache, nausea and vomiting, as well as other intracranial hypertension symptoms. Rachiocentesis examinations showed that Cerebrospinal Fluid (CSF) was thick and slightly yellow, thin film was formed after standing, lymphocytes were 300 × 106/L, protein was 217 mg/dL, CSF pressure was 350 mmH2O, sugar and chloride levels were reduced, and CSF acid fast staining had positive result. We diagnosed the patient with hematogenous disseminated pulmonary TB and tuberculous meningitis. He was in coma on day 70 after transplantation, and died on day 75. Anti-TB drug screening showed that the patient had multi-drug-resistant TB and his gene of drug resistance was katG (S315T) as detected by real-time polymerase chain reaction. Figure 1: Computed Tomography (CT) of the lungs of patient 1 showing diffuse nodular shadows on the two lungs. 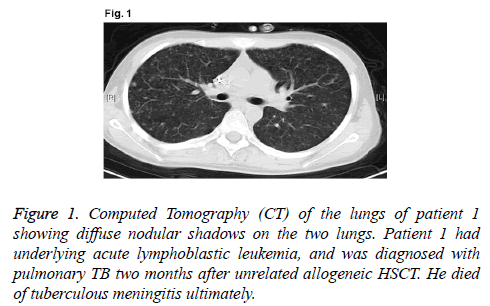 Patient 1 had underlying acute lymphoblastic leukemia, and was diagnosed with pulmonary TB two months after unrelated allogeneic HSCT. He died of tuberculous meningitis ultimately. A 45-year old female patient had been diagnosed with thymic extra-nodal marginal zone B cell lymphoma IVB in December 2008. There were 1.5% lymphoma cells in bone marrow. Lymphoma treatments included Cyclophosphamide, Adriamycin, Vincristine, and Prednisone (CHOP) for three times, ICE once, FMD once, and mediastinal radiotherapy once. In October 2009, the patient received auto-HSCT. Myeloablative conditioning regimen was consisted of meccnu, cyclophosphamide, cytarabine, and etoposide (Meccnu+CTX +Ara-c+VP16BEAC). On day 10 after transplantation, WBC rose to normal; on day 16 after transplantation, PLT rose to normal. On day 105 after transplantation, the patient had low fever, a little cough with less sputum, and the highest temperature of 38.5°C. Routine analysis of blood showed: WBC, 5.6 × 109/L; Hb, 99 g/L; PLT, 176 × 109/L; N, 66.4%. Pulmonary CT showed that right upper lobe and left lower lobe had patchy high density, while right lung had visible lymph nodes (Figure 2). Bronchoscopy showed that bacteria and acidfast bacilli were not found in bronchial brush or sputum culture. The patient received empirical antibiotic therapy by meropenem, vancomycin and voriconazole, and the deep venous catheter was removed. However, her symptoms were not alleviated, and cough and expectoration were aggravated. There was no lymphoma cell in bone marrow, superficial lymph nodes or mediastinal tumor progression. Repeated sputum culture showed positive result of acid-fast bacilli (+) on day 130 after transplantation. The temperature became normal after one week of anti-TB treatment with isoniazid, rifampicin and pyrazinamide. Review of the lung CT showed that lesions were significantly reduced. Drugs were discontinued after 6 months of anti-TB treatment. The patient was stable in the latest follow-up visit in April 2014. Figure 2: Computed Tomography (CT) of the lungs of patient 2 showing that the right upper lobe and the left lower lobe had patchy high density, while the right lung had visible lymph nodes. 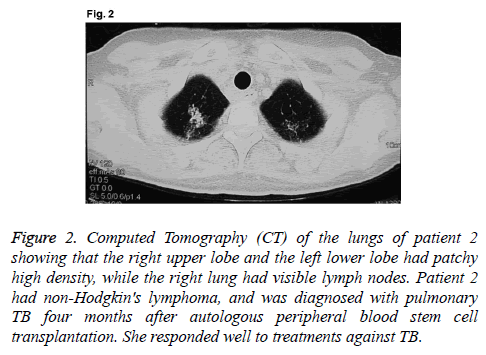 Patient 2 had non-Hodgkin's lymphoma, and was diagnosed with pulmonary TB four months after autologous peripheral blood stem cell transplantation. She responded well to treatments against TB. The main TB infection site in patients after HSCT is lung. Patients usually have symptoms like low fever and night sweats, and half of them have cough or expectoration, which are always mild at the beginning. Because of immune dysfunction, the body’s defense mechanism is impaired. The patient may be affected by other infection and have high fever. TB can appear with a variety of clinical manifestations with multiple lesions. TB is easy to be confused with graft-versushost disease, difficult to be cured, and has the potential to spread [2,3]. The two patients reported in this article had slight cough and a little expectoration at the beginning. Their main clinical manifestation was fever and their pulmonary CT showed typical manifestations. Patients are easy to be complicated with infections after HSCT, such as cytomegalovirus, Pseudomonas aeruginosa, and Aspergillus. This makes early diagnosis difficult, and misdiagnosis and missed diagnosis usually occur. At present, methods for diagnosing TB include bacterium Mycobacterium tuberculosis skin test (TsT), immune-mediated interferon gamma cell release test, imaging examination and microbial etiology inspection. TsT is based on Purified Protein Derivative (PPD) kin test that is traditionally used to determine whether there is TB infection. Patients after HSCT have immune dysfunction and are easy to be affected by false negative results, which influence its clinical application value. T-cell Interferon Gamma Release Assay (TIGRA) relies on the fact that T-lymphocytes will release IFN-γ when exposed to specific antigens of mycobacterium tuberculosis. TIGRA is superior to TsT in sensitivity and specificity, especially in the detection of HIV infection and autoimmune diseases, for those who have hypoimmunity after HSCT [2,4]. Chest imaging of typical pulmonary TB can show visible fibrotic induration lesions, infiltrating lesions, caseous lesions and cavity. If patients after HSCT are infected with TB, chest imaging will show different image findings. It can display inhomogeneous miliary shadows and fusion patch shadows. Proliferative lesions and cavity are also uncommon. Spiral CT examination has a high value for the diagnosis of pulmonary infection, especially when patients after HSCT have other infections [5,6]. Bacteriological examination is very important for the diagnosis of TB. For patients who are highly suspected of TB after transplantation, concentrating bacteria and checking after concentrating can increase the detection rate. For patients who have clinical symptoms, but negative results in repeated sputum Mycobacterium tuberculosis culture, examinations of bronchoalveolar lavage fluid and urine, feces, cerebrospinal fluid or pleural effusion, and ascites are also very important. If there is extrapulmonary infection, blood test, secretion test of corresponding parts, and tissue cell test should be carried out. If necessary, lymph node and liver puncture biopsy should be checked to find pathogenic basis. Recently, polymerase chain reaction test of mycobacterium tuberculosis DNA from sputum, blood, urine, and pleural effusion can greatly improve the detection rate of pathogens [7,8]. At the beginning, we did not find the pathogenic basis in the two cases. However, Mycobacterium tuberculosis was found in the sputum specimen of one patient and the cerebrospinal fluid in the other patient with the progress of the disease, leading to the final diagnosis. When we treat patients who are infected by mycobacterium tuberculosis after HSCT, we should follow the rules of “early, moderate, united, regular, and all stages”. Early empiric therapy is very important, especially for patients with blood disseminated diseases and multi-drug resistance. These patients have poor prognosis and rapid progression, and are easy to progress into tuberculous meningitis, losing the timing of treatment. Therefore, we should perform drug-sensitivity test as soon as possible and pay attention to the treatment of complications and reasonable assessments. In addition, immunosuppressive agents can be used to protect patients’ organs. In order to avoid recurrence, regular reexamination is needed after the patients are cured. In high incidence area, the application of preventive medicine is an effective method in preventing diseases for HSCT patients with infection history [9-11]. Although the two patients reported in this article have received diagnostic treatments early, one has died because of drug resistance and rapid progression to tuberculous meningitis. It might be a different outcome if the patient has received earlier intervention. The authors would like to thank Professor Yuhong Zhou of the First Hospital Affiliated to Zhejiang University of Traditional Chinese Medicine for her contribution to this work. All authors declare no non-financial competing interests. Liu M, Yang C, Liu L, Shi B, Hu W, Ye L, Zhang Y. Hematopoietic stem cell transplantation for treatment of patients with leukemia concomitant with active tuberculosis infection. Med Sci Monit 2014; 30: 2484-2488. Al-Anazi KA, Al-Jasser AM, Alsaleh K. Infections caused by Mycobacterium tuberculosis in recipients of hematopoietic stem cell transplantation. Front Oncol 2014; 26: 231. Russo RL, Dulley FL, Suganuma L, França IL, Yasuda MA, Costa SF. Tuberculosis in hematopoietic stem cell transplant patients: case report and review of the literature. Int J Infect Dis 2010; 14: 187-191. Moon SM, Lee SO, Choi SH, Kim YS, Woo JH, Yoon DH, Suh C, Kim DY, Lee JH, Lee JH, Lee KH, Kim SH. Comparison of the QuantiFERON-TB gold in-tube test with the tuberculin skin test for detecting latent tuberculosis infection prior to hematopoietic stem cell transplantation. Transpl Infect Dis 2013; 15: 104-109. Yeh JJ, Neoh CA, Chen CR, Chou CY, Wu MT. A high resolution computer tomography scoring system to predict culture-positive pulmonary tuberculosis in the emergency department. PloS One 2014; 9: 93847. Bolursaz MR, Mehrian P,Aghahosseini F, Lotfian F, Khalilzadeh S, Baghaie N, Hassanzad M, Velayati AA. Evaluation of the relationship between smear positivity and high-resolution CT findings in children with pulmonary tuberculosis. Pol J Radiol 2014; 26: 120-125. Choi Y, Jeon BY, Shim TS, Jin H, Cho SN, Lee H. Development of a highly sensitive one-tube nested real-time PCR for detecting Mycobacterium tuberculosis. Diagn Microbiol Infect Dis 2014; 80: 299-303. Heydari AA, Movahhede Danesh MR, Ghazvini K. Urine PCR evaluation to diagnose pulmonary tuberculosis. Jundishapur J Microbiol 2014; 7: 9311. Jeong J, Kim SR, Chang CL, Lee SH. Identification of Mycobacteria species by HPLC and species distribution during five years at Ulsan university hospital. Korean J Lab Med 2008; 28: 24-33. Holty JE, Sista RR. Mycobacterium tuberculosis infection in transplant recipients: early diagnosis and treatment of resistant tuberculosis. Curr Opin Organ Transplant 2009; 14: 613-618. Ahmed P, Anwar M, Khan B, Altaf C, Ullah K, Raza S, Hussain I. Role of isoniazid prophylaxis for prevention of tuberculosis in haemopoietic stem cell transplant recipients. J Pak Med Assoc 2005; 55: 378-381.